Attendees at the unveiling event are briefed by Jean Botti, the company’s Chief Executive Officer and Corporate Technical Officer. In the foreground of VoltAero’s headquarters hangar is the “Iron Bird” integration platform. VoltAero outlined its vision for the future of safe, quiet, efficient and eco-friendly flight with the unveiling of its hybrid-electric Cassio aircraft during an event held in the company’s headquarters facility at the Aérodrome de Royan-Médis in France. Attended by elected officials, industry representatives, partners, journalists and others, the unveiling provided VoltAero the opportunity to detail its plan for the initial development and production of an aircraft seating 4-6 passengers utilizing a “push-pull” propulsion configuration combining electric motors and an internal combustion engine. Jean Botti, VoltAero’s Chief Executive Officer and Corporate Technical Officer, underscored the Cassio aircraft’s unique features, including its distributed “push-pull” configuration using two wing-mounted electric motors with propellers in the “pull” function, and a patented hybrid system in an aft fuselage power module that combines an electric motor and an internal combustion engine for the “push” propulsion and for recharging of batteries. 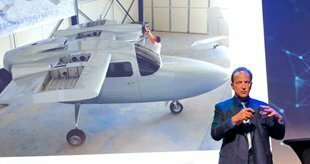 VoltAero CEO and CTO Jean Botti points to a cutaway view of the Cassio 1 flight demonstrator aircraft while Technical Director Didier Esteyne provides technical details to the unveiling audience. VoltAero’s concept-proving for the Cassio aircraft began with a ground-based “Iron Bird” integration platform, which enables the installation and validation of the hybrid electric propulsion system, to be followed by a flying testbed aircraft, designated Cassio 1, which is based on the existing airframe of a Cessna 337 Skymaster. The Iron Bird was in the VoltAero hangar for the unveiling event, along with the display of key electric system elements, including the electric motors and battery cells. Once the hybrid electric propulsion system is demonstrated and proven with the Iron Bird platform and Cassio 1 flight testbed, VoltAero will move into the prototype phase with Cassio 2 – an all-new airframe design using composite materials but retaining the overall “push-pull” propulsion arrangement validated with Cassio 1. First flight of Cassio 2 is targeted for 2020, followed by the startup of deliveries for production-definition aircraft – designated Cassio – beginning in late 2021/early 2022. Botti said this multi-step approach de-risks the program, beginning with the Iron Bird for system integration and testing, followed by the flight evaluations with a certified Cessna 337 Skymaster aircraft – which will be progressively modified to the full Cassio propulsion configuration. The “Iron Bird” integration platform is a key element in VoltAero’s strategy to de-risk the development of its Cassio hybrid electric aircraft. Production Cassio aircraft are intended for multiple uses, from personal and business transportation to charter flights – linking cities that otherwise are not served by the airlines. Cassio’s estimated flight duration with the hybrid electric propulsion system is approximately 3.5 hours. First phase funding has been secured by VoltAero for the Cassio project, covering the development work, Iron Bird integration and flight test. Overall, the program’s cost – taking it into production – is estimated at €70 million, with the additional funding to be raised in future financing rounds. Also participating in the unveiling event at the Aérodrome de Royan-Médis was Alain Rousset, President of France’s Nouvelle-Aquitaine region, which is home to VoltAero – and is participating in funding the current phase of activity. He underscored the importance of France maintaining its aviation leadership through VoltAero and its Cassio aircraft development. “VoltAero continues Nouvelle-Aquitaine’s relationship with innovators in various sectors, and we look forwarding to a long relationship with Jean Botti, who brings his impressive background in cutting-edge aviation and a demonstrated expertise in electric aircraft,” Rousset added. Series production of the Cassio aircraft will be performed in the Nouvelle-Aquitaine region, with the location to be determined, according to Rousset and Botti.